Discover how Rotacaster can be a game changer for your product or application. 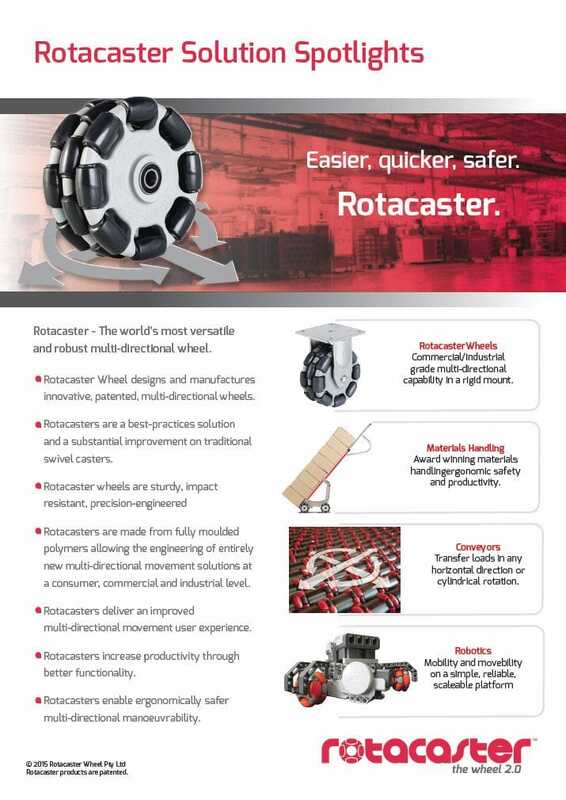 We are seeking clients and partners who see opportunities to create win-win solutions using our patented Rotacaster omni-wheel to overcome mobility challenges and design constraints. A large commercial baker was looking for an ergonomically safe way to move stacks of 12 and 15 bread crates. These stacks are 1.80m and 2.25mm tall respectively. Fully loaded they weigh as much as 185Kg with a challenging very high centre of gravity. Traditional hand trucks required the operator to support the load, making it difficult to see past the load when moving forward. By adopting the self-supporting Rotatruck, the company was able to focus it’s staff on safely guiding the crate stacks while transferring them, rather than having to primarily support them. This significantly improved the ergonomic handling qualities for the user, including reduced fatigue. To secure the crates to the truck, Rotacaster developed a patented self-engaging latching system that is easily disengaged after placing the crate stack. Productivity is further improved by the use of the multi-directional Rotacasters fitted to the front of the wheelbase and enabling precise multi-directional manoeuvrability. Importantly, the use of Rotacasters allows the easy change of direction without destabilising the tall load, as unlike traditional swivel casters, Rotacasters are in a fixed mount. The solution requires no power to the wheels and minimal maintenance, while delivering reliable productivity. Leading Australian grocery retailer Woolworths needed to improve its back of store operations resupplying milk into the rear-loading display fridges. The objective was to reduce injuries, increase productivity and improve the user experience. 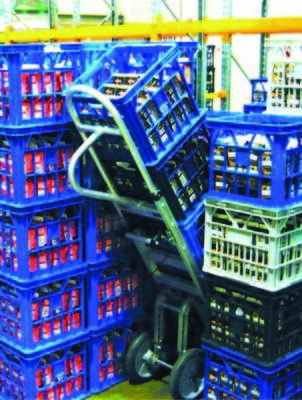 Rotacaster developed a specialised Rotatruck to pick-up the milk-crate stacks from the delivery pallets and deliver them to the fridges, from where individual bottles could be transferred into the display. The solution significantly reduced the amount of bending required as well as the effort required to transfer the milk from the crates to the display. In addition to a 12 month multi-site trial, movement specialist dorsaVi electronically analysed flexion and forces with and without the Rotacaster solution and found significantly reduction in both, as well as improved productivity. This data was confirmed in the final data generated by the trial across a substantial number of sites. of its stores. While considered a significant capital investment, ROI is expected in 90 days. Since then the Milk-Crate Rotatruck has been adopted more widely across a range of organisations including several dairies. We estimate that in 2014 more than half of Australia’s packaged milk will be transferred on Rotatrucks. A leading Australian manufacturer and distributor of beverages and milk products needed to improve its milk distribution and reduce manual handling risks. Replacing its current hand-trucks, the solution needed to suit not only their specific distribution centre needs, it also needed to integrate into the supply chain. 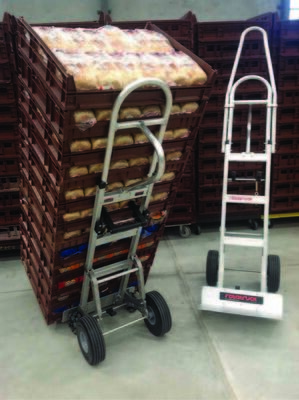 Rotacaster developed a specialised Rotatruck to not only pick-up the milk-crate stacks from the floor and delivery pallets, but to be able to retrieve crates from between crate stacks. To complicate matters, the client needed to be able to handle two different crate styles. To meet the client’s needs, Rotacaster developed a new narrow-isle wheelbase and adapted Rotacaster ’s patent-pending adaptable latching system, designed to securely autoengage the milk-crates, to work inside the narrow body as well as adjust to different crate heights. A second solution was developed to pick-up two crate stacks at a time to further improve productivity, especially when interfacing with the supply chain, specifically the loading and loading of large trailers. The solutions reduce the effort required to transfer crate stacks, improves safety and productivity, especially critical to the supply chain, specifically. The Milk-Crate Rotatruck has adopted widely across a range of organisations including dairies. We estimate that in 2014 more than half of Australia’s packaged milk will be transferred on Rotatrucks. The solution requires no power and minimal maintenance, while delivering reliable and improved productivity. and two medical oxygen cylinders with minimal load tilt. Rotacaster developed a specific two wheel hand truck to meet these requirements and the strict rules associated with handling liquid nitrogen. It consists of a light but robust folding aluminium frame and an extra large folding toe to accommodate the two liquid nitrogen dewars and provide a compact solution. An additional frame mounted rubber extrusion significantly reduces the risk of damage to the dewars while attached straps stabilise and secure the load. A sturdy bag fixed between the frame enables the transportation of up to two additional oxygen bottles. Other features include a release strap that enables the toe to be folded without bending, and the reduced handle height allows the operator to minimise the load tilt. A large Mexican white goods distributor needed to improve the handling of the large and tall loads such as washers and dryers. Using traditional 2-wheel hand trucks, the user had to negotiate their way without being able to see well as they had to balance the heavy load which put considerable ergonomic stress on the body. walk offset from the load and see where they are going. This significantly improved the ergonomic handling qualities for the user, including reduced fatigue. Importantly, the use of Rotacasters allows the easy change of direction without destabilising the tall load, as unlike traditional swivel casters, Rotacasters are in a fixed mount.